Last September, I attended a conference on Music and Physical Disability organized by the OHMI Trust. While I was there, I heard many speakers reference the “Social Model of Disability.” This idea proposes that it is the attitudes and structures in society that make someone disabled rather than their impairment or difference. How does this change our conception of instrumental music education? If instruments were designed to be played with three arms or two heads, we would all be disabled. Conversely, if a student with limited movement has an instrument controlled by the same joystick she uses for her electric wheelchair, she is no longer disabled. She is an instrumentalist. We can make instrumental music more accessible to students with physical disabilities in a variety of ways. These can be categorized as follows: changes in technique, instrument supports, adapted and customized instruments, and instrument selection. As a majority of musicians are able-bodied, teachers may have preconceived notions of exactly which body parts are used to play each instrument and how. 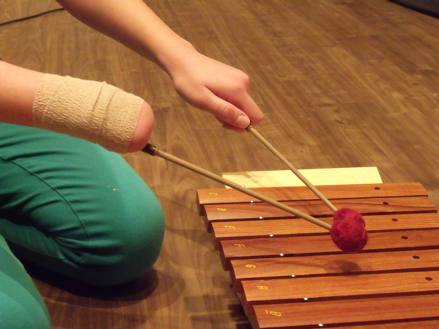 Students with physical disabilities should be encouraged to use whatever technique allows them to play at the highest level possible. The right hand can be on top for a recorder, or the left pinky can cover hole four. Toes can hold barred instrument mallets. A violin can be held like a cello (see Gaelynn Lea). Trumpets and tubas can be fingered with the left hand. Instruments are for playing, not for holding! 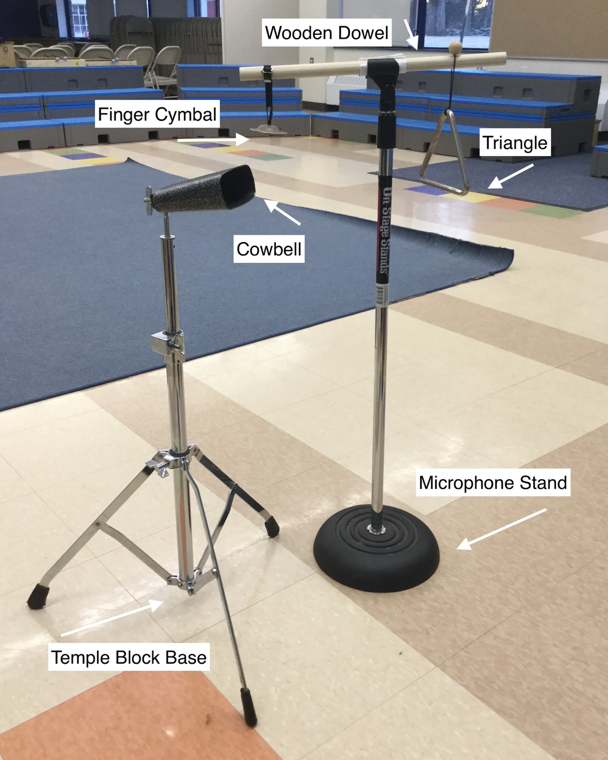 Instrument supports can make a tremendous difference for students with physical disabilities. Velcro and ACE bandage wrap can be tools for brainstorming and even creating solutions. Bike gloves can be adapted to hold mallets for those missing fingers or with low muscle tone. Look around your classroom as well. Percussion stands and microphone stands can hold small percussion instruments. The Clave Companion is a simple device for creating a resonance chamber. MERU has created stands for brass instruments and guitars. The MBrace and Viking Stands hold guitars, and I imagine they could hold ukuleles. Although they are typically more expensive, adapted and personally customized instruments offer students the best opportunity to have instruments that work for their bodies. At the most basic level, a standard instrument can be modified. Strings can be swapped on a ukulele so that a player can use the right hand on the fretboard. A trombone can be set up so the left hand can operate the slide. For a more in-depth look at adaptive recorders, read my article in the Fall 2018 issue of the Orff Echo. I would like to mention, however, two new products that I learned about post-publication. 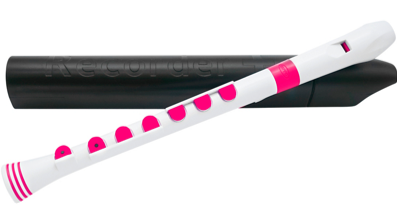 Nuvo Soprano Recorder with Keys: This instrument is a fully-keyed recorder, and it only costs $15. I think this instrument could be useful for students with finger disabilities as well as students who receive OT/PT services. 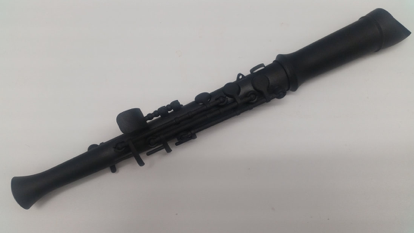 3D Printed One-Handed Recorder: This instrument was commissioned by the OHMI Trust to be an affordable one-handed recorder. It is not commercially available yet, but it will be soon! Peter Worrell and Maarten Visser are both phenomenal instrument makers who specialize in customized woodwind instruments. Their work is extraordinary! The instruments we have in our classroom are typically a miniscule selection of the musical instruments in the world. If our goal is to inspire all students to play instruments, we may need to look beyond what we have in our classrooms. Consider introducing students with disabilities to a broad selection of instruments. What could your student play? Harmonica, tabor pipe, ocarina, alphorn, Native American flutes, berimbau, didgeridoo, autoharp, Chapman stick, the list goes on! The EyeHarp allows the user to play music by tracking eye movements. It is free and open-source! AUMI allows users to create music through movement and gestures. The Linnstrument is an expressive midi controller. Orphion is an app for iPads that allows the user to customize pitch sets, timbre, and articulation through touch. When you have a student with a physical disability, talk to your student and your student’s family outside of class to brainstorm ideas. Students know their bodies best, and they will be able to tell you what works and doesn’t. Consider experimenting like your student. I will always remember the first time I met my college piano professor. She asked me how I played a scale, and then she sat down and played it with only her thumb and her index finger. It was the first time anyone emulated what I did at the piano. Immediately I was charmed by her empathy, and for years she continued to play with seven fingers when she helped me figure out solutions. Not only can you reach out to your students and families, but colleagues at your school. Get to know your team of special educators. OT and PT teachers may not know about musical instruments, but they do know about how to create adaptations and modifications, and their rooms are often filled with helpful supplies. Find out if your student is on an IEP or 504 plan (and if so, read it!). If your student is on a plan, school funds may cover the cost of adaptations. I know a boy whose school bought him a Dolmetsch one-handed recorder ($$$)! Not all students may be on plans; I never was, for instance, as my parents and teachers didn’t think I needed one. Regardless of what formal documents your students may or may not have, your colleagues can give you advice about how to create adaptations which you can tailor to apply to instruments. It is crucial to find out which musical timbres your student prefers. Even if trombone is the most practical band instrument for your student to play, she may not get very far if she dislikes the sound of the trombone. If your student loves the sound of the flute, but a flute is inaccessible, is there another instrument with a similar timbre that she can try? For instance, Matthias Schlubeck is a professional panpipe player with no hands. While finding any and all instruments that work for your students is worthwhile, do consider students’ strong social motivation to do what their peers are doing. If your class is playing recorders but your student with a disability is playing a woodblock, make sure that several other students are also playing a woodblock. If it is possible for your student to play a modified part on a recorder, do so. As Orff-inspired teachers, we already gravitate towards layered, differentiated parts, and creating adapted parts for students with disabilities can and should be part of our planning. Students with physical disabilities have the same interest in creating music as their able-bodied peers. Our role is to find a way for them to play. With careful consideration, we can help students find instruments they can enjoy for a lifetime. I love brainstorming solutions and learning about more, so feel free to contact me to discuss ideas! Thank you so much! I have a very bright 2nd grader who was born with nothing below his elbow on his left arm. He so wants to play with two mallets like the rest of his classmates, and will learn recorder in 3rd grade and ukulele in 4th. I have searched for months for solutions, and your article was immensely helpful. Thanks, Beth! Keep in touch if you want to brainstorm more! Bravo, Valerie!!! You bring so many possibilities to life for so many adult and school-age learners! Thank you! Thank you for writing this!! Your work is so very important!! Valerie, thank you so much for this article. One of our teacher’s daughter is differently abled and uses her eyes to control a board, so the eyeharp might be a possibility. I also like the recorder with keys. There are a couple of kids who could really benefit from this (and I can think of another handful who would like to try it as the “easy way” out!) . We have a DCD program at our school and are adding more students next year, so I am always looking for ways to adapt for them with limit time and uncertain para support! Thanks again! Thank you so much for writing this article. I am interested in how your adapt bike gloves for students to hold mallets. 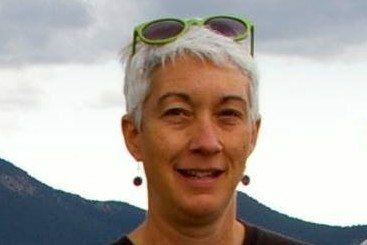 I would like to learn about how to present Orff instruments, a mini orchestra, to seniors, and I am open to advice, suggestions, links, be it to articles or people! I am a level 1 Orff instructor. This is great, Valerie. If one restrings a uke or guitar for left-handed use, it should really be reset. The dealer should be willing and able to do this. For certain asymmetrical models, a left-handed instrument will probably be needed (although lefty Jimi Hendrix played right handed guitars) and will likely need to be special ordered. Good point, Alex! Thanks for your input! Thanks for this helpful information! It’s really good to know all the options we have to support our students. Great article, Valerie. Thank you. Thank you so much and for all the love that was underneath all the wisdom!